I saw From Justin to Kelly in a theater. And while I wasn’t a full blown Claymate, did I see Clay Aiken in concert? Why yes, I did. It’s important that you know exactly what kind of American Idol fan you’re dealing with—I adored the show. I was with it from the moment it premiered on June 11, 2002. I loved Paula’s loopy cheeriness and Randy’s repetitive encouragement. (What can I say, dawg?) At first, I didn’t even mind Simon’s brutal criticism. But somewhere along the way, the show lost me. Partly due to the rotating judges. It was never the same after Paula and Simon left. Ellen DeGeneres was too much of a fan and way too kind. Nicki Minaj and Mariah Carey were more caught up in their own drama and their juvenile bad blood eclipsed the show’s purpose—turning unknowns into stars. The show began to delight more in the bad singers (the William Hungs of the world) than the good ones. And, worst of all, American Idol stopped producing stars. Without looking it up, tell me who won Season 15. I triple dare you. And the series was so freaking time-consuming. In the age of peak TV, who can devote four hours a week (and sometimes more!) to a single TV series? When the reality juggernaut had its grand finale on April 7, 2016, I cynically predicted it would be back in less than five years. Clearly, I wasn’t being cynical enough. The series returns with a two-hour premiere Sunday at 8 p.m. on ABC. Suffice it to say that, in order for absence to make the heart grow fonder, you have to be gone for more than 23 months. ABC has long wanted a hit singing competition series (Duets, Rising Star, I could go on). While they’ve cornered the market on people looking for love in all the wrong places thanks to The Bachelor and Bachelorette franchises, they’ve had no luck launching an Idol or The Voice of their own. So Idol is moving from Fox to ABC, with Ryan Seacrest still the host and franchise newcomers Lionel Richie, Luke Bryan and Katy Perry as the judges. 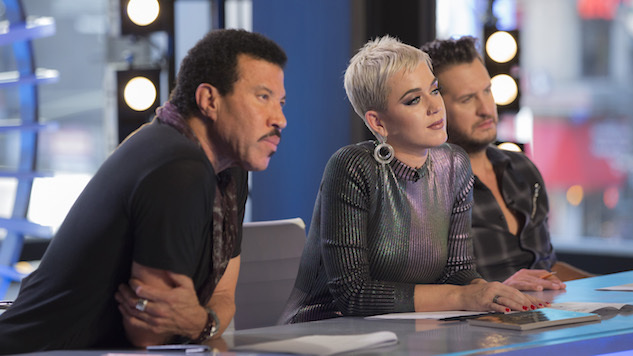 In the two-hour premiere, it’s business as usual as the series travels from New York to Nashville to Los Angeles searching for the next American idol. Niceness prevails. Constructive criticism trumps any kind of cruel condescension. Maybe that’s the Disney way. (That said, this is the same network that recently filmed the Bachelor dumping someone after an accepted proposal). And in the Trump era, when the president of the United States resorts to name-calling and belittling those who don’t agree with him, it’s a welcome reprieve. We don’t need any more bullying, anywhere. You can tell someone they aren’t the right fit for the show without destroying their spirit. Perry, in particular, excels at this. She kindly tells contestants that other people are quite simply out-singing them or that they need to continue to work on their skills or that their voice is better suited for a different medium. “Sometimes you have to separate the story from what we are looking for,” she tells one contestant with a particularly compelling background. Is Perry worth her reported $25 million salary? I mean, could anyone possibly be? But she is good. She’s also the one most of the contestants want to meet, and she welcomes the attention, flirting with those who are willing—even giving one boy his first kiss. Bryan and Richie have some interesting points to make as well, and the trio shares a nice rapport. But Perry is the breakout at the judges’ table. Clip packages instantly make us care deeply about contestants we weren’t aware of 15 seconds earlier. There’s the teen who botched “The Star-Spangled Banner” when she was 11. The man who emigrated from the Congo as a child. The girl who brings her seven-year-old sister into the audition with her. Making viewers instantly root for people is key. Seacrest has always taken a backseat to the proceedings at this stage of the show. And he seems to have even less of a presence than I remember. He’s not seen that often chatting it up with the contestants. The real question is what will happen when the series moves to the live shows, where he plays a critical role in keeping the proceedings moving. He’s been accused of sexual abuse, and E!’s decision to keep him on the red carpet for the Academy Awards backfired, as most stars avoided talking to him and E! was left with a lot of dead air. Although an independent investigation cleared him, his accuser recently gave an interview to Variety. This problem for Seacrest isn’t going away. And it presents a problem for ABC. If you liked American Idol in the past, you’ll probably like this version, which is, at least so far, virtually unchanged. But did you miss the show? Do you want it back? ABC is betting the answer is “Yes.” But I’m not so sure. American Idol premieres Sunday, March 11 at 8 p.m. on ABC.